The sophisticated, bitter, almost iodine taste of saffron is a constant source of fascination to me. Crocus sativus, a member of the iris family and a similar-looking flower to the latter, contains the deep red style (the female sexual organ and the central part of the blossom) and the yellow stamina (the male sexual organ which doesn't possess a taste of its own). How can this complex, somewhat hay-like odour be possible through such an unlikely material? The answer lies in the chemicals picrocrocin and safranal. The bitter glucoside picrocrocin (deriving from the Greek word πικρός/picros and approximately 4% in dried saffron) is responsible for saffron's flavour and is a precursor of safranal. Essentially it's the marriage of the terpene aldehyde safranal (systematic name: 2,6,6-trimethylcyclohexa-1,3-diene-1- carboxaldehyde) and a carbohydrate which accounts for its formation. Saffron contains several carotenoids in fact: α- and β-carotene, lycopin and zeaxanthin. Safranal is a volatile oil, less bitter than picrocrocin and often comprises up to 70% of dry saffron's volatile fraction. It's hereby interesting to note that the related safraleine has been used by perfumers to render the hint of a leather note in some fragrances, accounting for a note of mixed shoe polish/black cherry/air conditioning refrigerating fluid (as referenced in our Production of Leather Notes article in our Leather Series). But the most intense chemical in saffron's odour profile is 2-hydroxy-4,4,6-trimethyl-2,5-cyclohexadien-1-one, which although is less quantitatively represented, contributes more intensely than saffranol in saffron's aroma. Saffron's rich golden-yellow hue on the other hand is due to the carotenoid α-crocin. You can see this in action if you take a couple of stigmata and infuse them in a cup of hot water: you will have a richly yellow-golden liquid in your hands with a very pleasing aroma. The harvest of the purple-hued flowers of crocus sativus is a long and arduous process that involves picking the stigmata by hand. Seeing the purple carpets of blossoms with my own eyes I couldn't help myself from sighing from the sheer beauty of it: The flowers range from incandescent to dusky as the sun changes angles on the horizon and the wind blows among the petals. Old women with 'babushka'-style foulards to protect themselves from the rays pick them slowly one by one, filling basket after basket. Dried, the stigmata are gently heated and along with enzymatic action, picrocrocin yields D-glucose and the above mentioned safranal. The aromatic potential is just one glimpse away. The history of saffron is no doubt fascinating and to this day saffron remains an expensive commodity, cultivated from the Western Mediterranean (Spain) to India (Kashmir). More than 80% of the global production (approximately reduced from 300 to 140 tons a year although according to same sources exportation is on the rise) is accountable to Spain (La Mancha region) and Iran. Saffron is not antithetical to cooler climates nevertheless. As we had referenced in the previous installment of the Saffron Series, the English town of Saffron Walden in Essex got its very name from local production in the 16th century ~yet the former saffron cultivation sites were eventually abandoned and the only remaining saffron producer north of the Mediterranean today is the 1200m-high Mund, a small Swiss village in the Wallis canton, which produces a few kilograms per year. Outside Europe, Iran is most productive, especially lately, finally overcoming the Spanish yield. Smaller amounts are harvested in Turkey and India with Kashmiri saffron possessing a very high reputation, yet hardly available outside India. 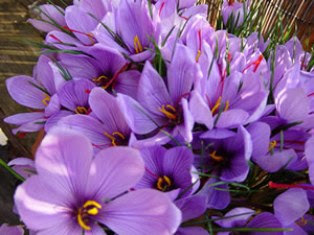 In Greece, saffron is a product of Protected Designation Of Origin and of Protected Geographical Indication. The Greek Red Saffron is classified as the highest quality saffron worldwide, as it lacks the bitter edge of the Iranian variety. The Co-Operative of the Kozani region in Northern Greece is selling their own organic version, hand-picked in whole stigmata, while the well-known Greek brand Korres (who joined the above co-operative with a 42.8% share) is also issuing their own packaging of organic saffron stigmata for the Greek and European market. Indeed the increasing scope of saffron as exploited by Korres can be seen in their newest Eau de Toilette for men, tagged Saffrom Amber/Agarwood/Cardamom. The illustruous heritage of saffron has reverted to its place of origin through the medium of today's technology! 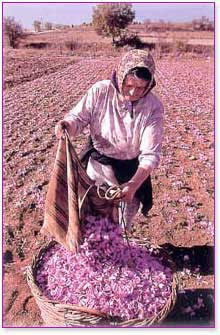 Pic of crocus sativus via irana.ir, pic of crocus harvesting via Kozani Co-operative. 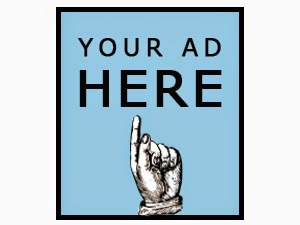 I never feel like I'm wasting time when I read your blog as besides being so enjoyable, it is also educational. 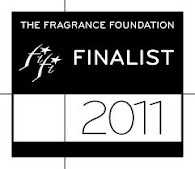 But I think I can see where this series is going - saffron fragrances! And as I've never tried any, your lyrical prose is going to induce (or is it seduce?) me to. I join the ones who look forward to follow this series! awww....you're so kind to me! Thank you sweetie for such profuse compliments. 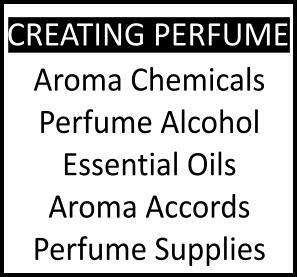 I think it's a lovely, interesting touch in fragrances, so I hope to entice you to try them out at least! I came to saffron from two ends at once; I was both a budding (oof!) gardener and cook when I started to learn more about both the plant and the culinary use of its stamens. At the moment, I'm probably deeper into the perfume applications than the gourmet aspects--always time to develop that as well, though :) --and I am loving this opportunity to "feed" my desire to learn. Thanks!